Necrotizing Fasciitis. It’s extremely rare, so you never think it’s going to happen to you or a loved one. Until it does. 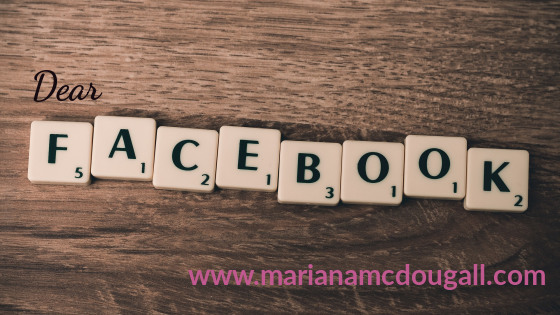 Dear Facebook, it’s not you; it’s me. In my journey to achieve the best health of my life, I’ve come to the conclusion that I need to stop caring so much about what other people think. If I’m serious about challenging the status quo and living life on my terms, it’s time to stop feeling the need to justify my actions. I’m doing what’s right for me and for my family, and their opinion is really the only opinion that matters. Certain social networks make it a little too easy to feel the need to justify everything. 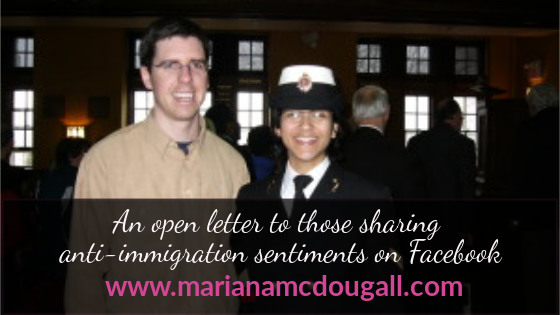 An open letter to those sharing anti-immigration sentiments on Facebook. The following post isn’t about writing. It isn’t about following dreams (well, at least not directly). But something has been on my mind since seeing a terrible meme on Facebook, and I needed to get these words out there. I was too disappointed for words after seeing someone who is supposedly a friend post anti-immigration sentiments on Facebook. What does that say about our supposed friendship? How does this person truly see me? Why is there this hatred of people in search of a better life, who are fleeing from unspeakable acts of violence? It is this kind of hatred and prejudice that creates the need for refugees to immigrate in the first place. Please, take the time to read my letter, and really consider the impact of your posts on social media before clicking the next share button on such a thoughtless meme. Please note that this letter is my sole opinion and sentiment and does not represent the views of the Canadian Naval Reserves or any other military branch.